1. In a dish large enough to hold the steaks, combine the wine, 2 tablespoons of the oil, the sliced garlic, the bay leaves and the peppercorns. 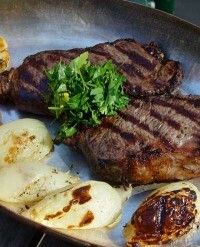 Lay the steaks in the dish, spooning the marinade over them, cover and refrigerate for at least 4 hours or overnight. 2. Take the steak out of the refrigerator 1 hour before cooking. Light the grill or preheat the broiler. 3. Bring a large pot of salted water to a boil. Cut the top 1/2-inch off the heads of garlic so all the cloves are exposed. Add the garlic and onions to the water and boil the garlic for 15 minutes, using a slotted spoon to remove the onions after 5 minutes. Drain on paper towels, then lightly brush the onions and garlic with olive oil and season with salt and pepper. 4. Take the steaks out of the marinade, season both sides with salt, and lay the steaks on the grill. Cook, turning once, until done to taste, about 4 to 5 minutes per side for rare. Let the meat rest for 10 minutes for the juices to reabsorb before slicing. Meanwhile, place the onions and garlic on the grill and cook, turning once, until they are golden on both sides, about 10 to 15 minutes. 5. Slice the steaks 1/4-inch thick and arrange in the center of a platter. When the garlic is cool enough to handle, squeeze the cloves from their skins. Arrange the garlic and onions around the steak and serve. 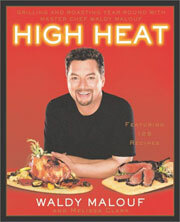 New York Strip Steaks with Black Pepper, Onions, and Garlic Recipe © 2003 Waldy Malouf. All rights reserved. All recipes and photos used with permission of the publisher.